We’d love your help. Let us know what’s wrong with this preview of The Secret Between Us by Barbara Delinsky. Nothing will break this mother-daughter bond. Not even the truth. The Secret Between Us is an unforgettable story about making bad choices for the right reasons and the terrible consequences of a lie gone wrong. Once again, Barbara Delinksy has delivered a riveting study of family and a superbly crafted novel, perfectly targeted to reading groups and fans of provocative fiction. To ask other readers questions about The Secret Between Us, please sign up. The Secret Between Us by Barbara Delinksy is truthfully painful. A good novel but with so much guilt that you really start to feel like it's you in the story. It's a can't put down book til the end so that you can see if things come out for better or worse. Deborah Monroe is mom, daughter, sister, ex-wife, and prominent town doctor to a quiet little town in New England. Highly respected and loved, independent, honest to a fault has her life upturned by one little incident. 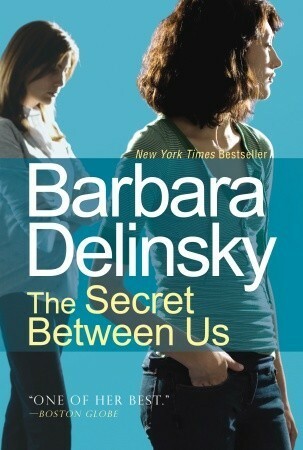 Oh, is it little or big The Secret Between Us by Barbara Delinksy is truthfully painful. A good novel but with so much guilt that you really start to feel like it's you in the story. It's a can't put down book til the end so that you can see if things come out for better or worse. Deborah Monroe is mom, daughter, sister, ex-wife, and prominent town doctor to a quiet little town in New England. Highly respected and loved, independent, honest to a fault has her life upturned by one little incident. Oh, is it little or bigger than she thinks. Grace Monroe is a loving, athletic, brilliant, devoted teen who knows right from wrong but the one little unfortunate incident throws her into such an emotional turmoil that you sit and wonder how your own child would react to the same thing happening to her. The entire town knows this teen as truthfully honest and reliable almost to perfection which sets Grace up for emotional pain that is unimaginable. The story brings into question what lengths we would go to as a parent in order to protect our children. It also questions our ability to handle one crisis following another as an adult especially in a small town where everyone knows everything about everyone. Can secrets truly be hidden in such a small community. Will one little deception tear a family apart not only from themselves but from all prying eyes. Can one selfish person willing cause so much emotional pain and break the trust that has been here for generations. So many questions with too few answers. A pleasant surprise. It wasn't challenging reading, but a good story that kept my interest. Would be good for a vacation book or beach book. Similar to Piccoult's style - but much better character development. I'm not done yet, but enjoying the book. It's easy reading. I got the book from the publisher as part of a buzz campaign through BuzzAgent.com I've been telling people that I know are interested in this genre of books about this book as well as the author. I thought at first that I would fi A pleasant surprise. It wasn't challenging reading, but a good story that kept my interest. Would be good for a vacation book or beach book. Similar to Piccoult's style - but much better character development. Okay. I picked up this book because I was looking for a new author like Jodi Picoult. This book was a quick read but dragged at times. I kept reading because I was intrigued by the topic and the relationships. A daugter kills a man while driving with her mother on a rainy night. The mother does not correct the police when they assume that the mother was driving. Made me wonder if I would do the same. Also, it reminded us how a lie can impact your life and how the truth can set up free. I could re Okay. I picked up this book because I was looking for a new author like Jodi Picoult. This book was a quick read but dragged at times. I kept reading because I was intrigued by the topic and the relationships. A daugter kills a man while driving with her mother on a rainy night. The mother does not correct the police when they assume that the mother was driving. Made me wonder if I would do the same. Also, it reminded us how a lie can impact your life and how the truth can set up free. I could relate to some of the characters. Deborah was trying to be the perfect mother, child, daughter, doctor. We all wear masks for the people around us. Who do not want to disappoint our parents at any age. Parents have expectations of their children. What is the right balance between hope for a child and expectations. Anger is such a big part of my life when things fail. The mother and daughter are both angry with the father for leaving. Sometimes you just have to let go of anger to get through life. At the same time I was jealous of her sister who lived her life like she wanted to. She opened a bakery and made it work. She was a success by following her heart. Deborah Monroe and her daughter, Grace, are driving home from a party when their car hits a man running in the dark. Grace was at the wheel, but Deborah sends her home before the police arrive, determined to shoulder the blame for the accident. Her decision then turns into a deception that takes on a life of its own and threatens the special bond between mother and daughter. "Hey, this sounds really good, I think I’m going to enjoy this!" The Secret Between Us is an unforgettable ("Oops a spelling error, they added 'un'.") story about making bad choices for the right reasons and the terrible consequences of a lie gone wrong. Once again, Barbara Delinsky has delivered a riveting study ("I’m pretty sure that’s an overstatement!") of family and a superbly crafted ("Spelling error #2, corrected to 'crappy'." ) novel, perfectly targeted to fans of provocative fiction. "No comment!!!" Was expecting more from this book and couldn't relate to any of the characters. It seemed to jump around a bit with different story lines. I haven't given up on this author just not one of my favorites by her. Deborah Monroe and her daughter, Grace, are driving home from a party when their car hits a man running in the dark. Grace was at the wheel, but Deborah sends her home before the police arrive, determined to take responsibility for the accident. But that story takes on a life of its own and threatens to damage the whole family. "Expectations are a powerful motivational tool"
3.5 stars. The Secret Between Us, a novel by Barbara Delinsky, defines "a fast read." The writing is clearly the effort of a pro and flows from page to page with lots of dialog and little description or prolonged prose. The storytelling is first rate. I was riveted. The main character, a woman named Barbara, is likeable and believable. She's a divorced mother of two, a small-town doctor. In the opening pages, she and her daughter, Grace, have a terri "Expectations are a powerful motivational tool"
The main character, a woman named Barbara, is likeable and believable. She's a divorced mother of two, a small-town doctor. In the opening pages, she and her daughter, Grace, have a terrible accident, when their car hits a pedestrian on a dark, rainy night. The story unfolds from there, when Deborah takes the blame, even though her 15-year-old daughter was behind the wheel. Throughout the police report/investigation, this is the "secret" between them and it causes a myriad of complications. Probably the strongest message coming from these pages is about parent and child relationships, and how expectations can both help and hinder. It certainly made me think about my relevant relationships. Deborah's sister, Jill, an independent bakery owner and somewhat of family black sheep, is likeable too. As for most of the other characters, I'm afraid I found them not only unlikable, but also contrived. The selfish ex-husband; the patriarchal--even cruel--father; the loopy, grieving widow; the kind-hearted chief of police; the philandering high-powered attorney and his pathetic wife/best friend of the protagonist; the brother of the accident victim, Tom McKenna, walking the tightrope between both sides of the issue; the accident victim himself, Grace's history teacher at the local high school; the visually impaired younger brother; and especially the teenaged daughter, Grace, all seemed to me like paper cutout dolls, with unsurprising words and actions. This book is the story of Deborah Monroe and her daughter, Grace. One night when Grace is driving home with her mother from her friend's house, a man comes hurtling in front of their car. It is raining heavily so visibility is far from good that night, because of this Deborah and Grace don't see the man until it's too late. Deborah, after finding out who the man is and making sure he isn't fatally injured, calls the cops and sends Grace home to take care of her brother, Dylan; which ultimately c This book is the story of Deborah Monroe and her daughter, Grace. One night when Grace is driving home with her mother from her friend's house, a man comes hurtling in front of their car. It is raining heavily so visibility is far from good that night, because of this Deborah and Grace don't see the man until it's too late. Deborah, after finding out who the man is and making sure he isn't fatally injured, calls the cops and sends Grace home to take care of her brother, Dylan; which ultimately covers up Grace's involvement, as the driver, in the accident. As Deborah Monroe and her teenage daughter, Grace, are driving home from a party that Grace attended; the unthinkable happens. Their car is in an accident; striking a man who is running in the dark. Although sixteen-year-old Grace was the one at the wheel, Deborah sends her daughter home before the police arrive, determined to shoulder the blame for the accident herself. Deborah's rash decision, made in an attempt to protect Grace, quickly takes on a life of its own. Her decision soon morphs into As Deborah Monroe and her teenage daughter, Grace, are driving home from a party that Grace attended; the unthinkable happens. Their car is in an accident; striking a man who is running in the dark. Although sixteen-year-old Grace was the one at the wheel, Deborah sends her daughter home before the police arrive, determined to shoulder the blame for the accident herself. Deborah's rash decision, made in an attempt to protect Grace, quickly takes on a life of its own. Her decision soon morphs into a deception, one that ultimately threatens the special bond between mother and daughter. In The Secret Between Us, Barbara Delinsky explores the limits of personal responsibility - responsibility of a mother to a daughter, of a daughter to a father, and of a husband to a wife. Overall, I really enjoyed reading this book. The plot is interesting, the characters are well-developed, and the story is well told. There are, however, a few things I didn't like much about the book. First, there are sometimes long descriptions that are not always helpful to the story. There are also some details that seemed inconsistent to me. For example, I didn't understand how Deborah knew where Tom lived. It is never said in the book that he gave her his address. In fact, he never even gave Overall, I really enjoyed reading this book. The plot is interesting, the characters are well-developed, and the story is well told. There are, however, a few things I didn't like much about the book. First, there are sometimes long descriptions that are not always helpful to the story. There are also some details that seemed inconsistent to me. For example, I didn't understand how Deborah knew where Tom lived. It is never said in the book that he gave her his address. In fact, he never even gave her his phone number; she got it from the caller ID. Also, at one point, Deborah is speaking on the phone with John and says she realized she spoke his name, (view spoiler)[so the investigators that are with her know who she was talking to (hide spoiler)]. However, I reread the dialogue, and Deborah not once said his name... I know these are not important details, but there the kind of things that annoy me as a reader. The Secret Between Us is a book all about, as you can guess, secrets. The main plot is about Deborah and her daughter Grace. One night, while Grace is driving, they hit a man on the road. Deborah decides to shoulder the blame by saying that she was the driver of the car. But, can the two of them live with the secret? Every character in the book conveniently has a secret. Drinking problems, eye sight problems, affairs, pregnancies, and the list goes on. The idea is how secrets, especially amongst The Secret Between Us is a book all about, as you can guess, secrets. The idea is how secrets, especially amongst family, can really do us more harm than good. Better out than in! The book is a bit contrived, trying to ram the "theme" down your throat, while everything wraps up in a neat package with a bow. I'm giving this book two stars because I didn't mind reading it. But when that's the best thing you can say about a book, that's really saying something, isn't it? Maybe I would have enjoyed it more if the book had stayed focused on the main "secret" of the mother covering for her daughter during a car accident. Instead, pretty much every other character in the book had to have a "secret", too, so the whole deception-eats-away-at-you theme got old real fast. The saccharine-sweet ending bugged me I'm giving this book two stars because I didn't mind reading it. But when that's the best thing you can say about a book, that's really saying something, isn't it? 3.5 stars. Not one of those "I couldn't put it down" type books, but interesting enough to keep the pages turning. A teenage daughter is driving the car when they hit a man. The mother doesn't correct the police when they assume it was her behind the wheel. And thus, a lie is born. And the web gets tangled. The story focuses a lot on relationships. Mother - daughter. Sisters. Father - daughter. Even Doctor and patient. Relationships that are built on trust - and become fragile when trust is betray 3.5 stars. Not one of those "I couldn't put it down" type books, but interesting enough to keep the pages turning. Much like a Jodi Picoult book. Mother allows daughter with her driving permit, to drive home in the rain. A man runs out in front of the car and is hit. Though not critically injured, he dies two days later because he did not tell caregivers about a drug he had been taking. Complications in the accident investigation ensue since mother sent daughter away from accident scene and neglects to tell police who was really driving. They assume it was the mother and she never corrects them. But guilt on Much like a Jodi Picoult book. Mother allows daughter with her driving permit, to drive home in the rain. A man runs out in front of the car and is hit. Though not critically injured, he dies two days later because he did not tell caregivers about a drug he had been taking. Complications in the accident investigation ensue since mother sent daughter away from accident scene and neglects to tell police who was really driving. They assume it was the mother and she never corrects them. But guilt only increase their problems. Fast-paced and very readable. Finished listening to this book today. It was a quick enough read (listen)....but the storyline was totally predictable. It kept my attention, but it was just a mediocre book. Nothing more/nothing less. It was a really good book with some thought provoking plots, but it could be quite depressing at times and not exactly riveting. It was always entertaining and engaging though, sparking your own thought and discussion throughout. A car accident changes the dynamics of an already-troubled family. Delinsky tries to make the story compelling but there is no real tension here and the resolution is somewhat unsatsifying. An easy read but also easily forgettable. Everyone has a secret...and oh what a tangled web. Interesting, but the ending seemed a bit too pat...not Delinsky's best. This book was very slow moving. I never really got into it, I just kept reading because I wanted to know what happened in the end. It was very predictable and not very exciting. I really enjoyed this book. It kept me interested enough to read the whole book in one afternoon. Very Good! Makes you stop and think. Just how far would you go for your daughter? I couldn't put it down. The decision of protecting your child even with a lie can't be an easy one. This book shows a mother's love for her child and how far she will go to protect her child. Great reading. I had a hard time putting it down because I had to see what would happen next.